I am heading to Fort Zachary Taylor this friday and I needed something to wear on my side. I wanted to make something subtle and sweet. I left the edge blunt on this for the time being. If I still have this sword when I return, I plan to grind more off the edge making it lighter and adding a sharp edge to it. Custom hanger with 24.25" blade and is 29 " Overall. Blade is satin polished with double hand ground fullers, stop edge and file worked spine. The blade is 1.125" wide at the hilt and .75" before the curve of the tip. 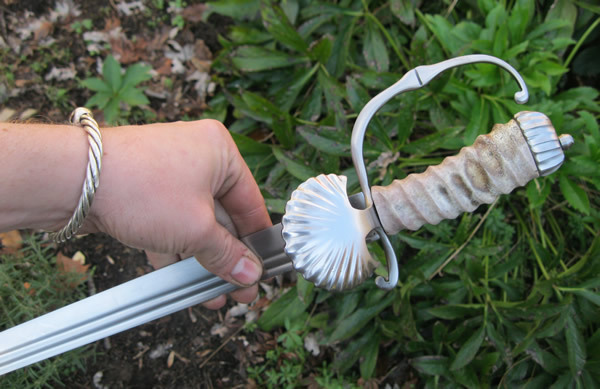 The spiral fluted handle is made of whitetail antler with fluted steel cap. 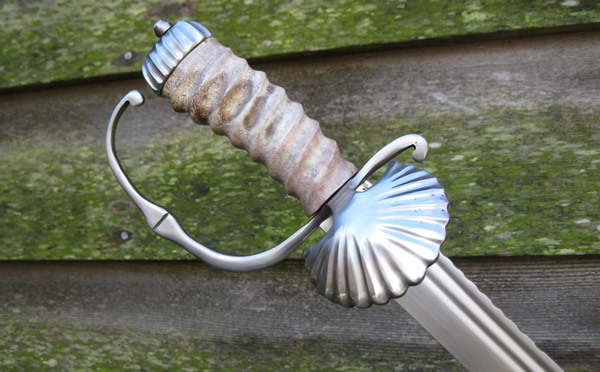 The edge is left blunt for stage combat use and the POB is 4" from the hilt. I will wager ye won't hold on to that one long...lovely. This is wonderful work. I need to start saving for a blade from you or actually a matched set of stage and combat ready. I really like this one. Well done! Thank you, thank you!!! I have returned home with thise piece and it is now for sale with or without a brown leather scabbard.